Sweet, flaky cookies with a nutty center. Combine flour, butter and cream cheese in a large mixing bowl. Beat on LOW speed until mixture resembles coarse meal. Knead until dough forms a ball, about 5 minutes. Put in the refrigerator to chill, while you prepare the filling or up to 3 hours, removing from the refrigerator 1/2 hour before rolling out. Crush walnuts in a large freezer bag with a mallet (that part is fun! ), mix the crushed walnuts, sugar, and milk together in a large bowl. On a surface sprinkled with powdered sugar, roll out dough to about 1/4 inch, cut into circles about 2 1/2 inches in diameter using a small cookie cutter or small glass. Preheat oven to 350 F. Using a 1/2 teaspoon measuring spoon scoop the nut mixture and place a scoop in the middle of HALF of the cut out cookies. A little over 1/2 teaspoon is okay, but watch you don't go too over, or the filling will come out while baking. Once half of the cookies are topped with the nut mixture, press another cut out cookie on top of each filled cookie, and press closed all around with the back of a fork. 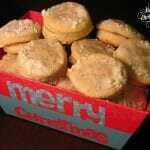 Sprinkle with powdered sugar, rubbing the sugar across the top of each cookie. Bake in the preheated oven for 15 minutes, or until a toothpick inserted into the middle of a cookie comes out clean.